As you probably know Microsoft have put a lot of hours into getting the Windows upgrade process to work from Windows 7 and Windows 8.1. On the other hand you have no dependencies to ADK, it’s a lot faster, there is built-in rollback if something goes wrong to get the user back to previous operating system exactly where he was. These files and folders will be automatically deleted after about 30 days. How does the 30 days grace period work? There is a scheduled task that will take care about this. The task is StartComponentCleanup, this will regularly clean up and delete components that are not in use and it is trigged by the operating system. The task will wait at least 30 days after an updated component has been installed before starting clean up of the old versions. 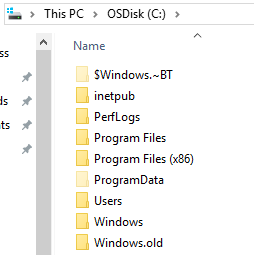 Can I add the command schtasks.exe /Run /TN “\Microsoft\Windows\Servicing\StartComponentCleanup” to SCCM TS to cleanup the disk after window 10 Upgrade ?